Family-friendly places like Scuba & Snorkeling and Nature & Wildlife Tours will thrill your kids. Change things up with a short trip to Palm Cove Beach in Palm Cove (about 32 minutes away). There's still lots to do: stroll through Esplanade Boardwalk, enjoy some diversion at Esplanade Lagoon Pool, admire the striking features of Freshwater Station, and let little ones run wild at Muddy's Playground. For photos, more things to do, traveler tips, and tourist information, you can read our Cairns trip planning website . Manchester, UK to Cairns is an approximately 23-hour flight. Traveling from Manchester to Cairns, you'll lose 10 hours due to the time zone difference. Traveling from Manchester in March, things will get much hotter in Cairns: highs are around 36°C and lows about 27°C. Wrap up your sightseeing on the 31st (Wed) early enough to drive to Port Douglas. Attractions like Scuba & Snorkeling and Wildlife Habitat Port Douglas make great kid-friendly stops. Spend the 2nd (Fri) spotting exotic species with a safari tour. Next up on the itinerary: identify plant and animal life at Hartley's Crocodile Adventures, view the masterpieces at Des Spencer Galleries, enjoy the sand and surf at Four Mile Beach, and relax and rejuvenate at some of the top local wellness centers. For more things to do, traveler tips, other places to visit, and more tourist information, refer to the Port Douglas trip app . Traveling by car from Cairns to Port Douglas takes 1.5 hours. Alternatively, you can take a bus; or take a shuttle. In March, daytime highs in Port Douglas are 36°C, while nighttime lows are 27°C. Finish your sightseeing early on the 4th (Sun) to allow enough time to travel to Townsville. Start off your visit on the 5th (Mon): have fun at Tobruk Memorial Baths, then browse the exhibits of Museum of Tropical Queensland, and then kick back and relax at The Strand. On the next day, see some colorful creatures with a scuba or snorkeling tour and then take in the pleasant sights at Castle Hill. Use Inspirock's suggestions to plan your Townsville trip and find the best activities and attractions for your vacation. Getting from Port Douglas to Townsville by combination of shuttle and flight takes about 4.5 hours. Other options: drive; or do a combination of shuttle and bus. In April, plan for daily highs up to 35°C, and evening lows to 24°C. Finish your sightseeing early on the 6th (Tue) to allow enough time to take a bus to Airlie Beach. Kids will appreciate attractions like Scuba & Snorkeling and Airlie Beach Lagoon. On the 7th (Wed), spend a thrilling day on the water with a speed boat tour. It doesn't end there: zoom along the surf with a waterskiing or jet-skiing adventure and take in the pleasant sights at Bicentennial Walkway. Plan my day in Airlie Beach using traveler tips and tourist information provided by Inspirock. Traveling by bus from Townsville to Airlie Beach takes 4 hours. Alternatively, you can drive; or do a combination of train and bus. Expect slightly colder weather when traveling from Townsville in April: highs in Airlie Beach hover around 31°C, while lows dip to 26°C. 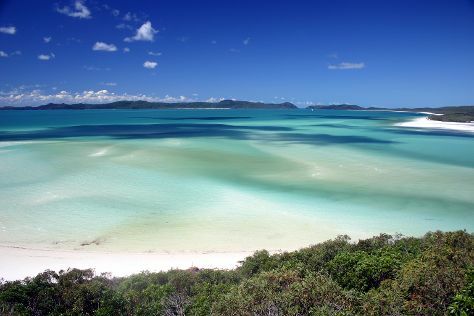 Finish your sightseeing early on the 9th (Fri) to allow enough time to take a bus to Whitsunday Island. Kick off your visit on the 10th (Sat): contemplate the waterfront views at Hill Inlet and then kick back and relax at Whitehaven Beach. Take the guesswork out of planning a Whitsunday Island vacation by using our trip itinerary maker. Getting from Airlie Beach to Whitsunday Island by bus takes about an hour. Other options: ride a ferry. Plan for slightly colder nights when traveling from Airlie Beach in April since evenings lows in Whitsunday Island dip to 22°C. 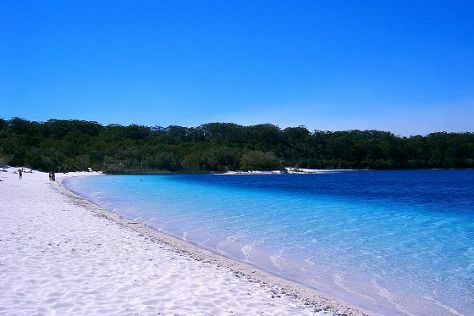 Finish your sightseeing early on the 10th (Sat) to allow enough time to travel to Fraser Island. You'll visit kid-friendly attractions like Indian Head and Eli Creek. For where to stay, ratings, maps, and other tourist information, go to the Fraser Island day trip site . Do a combination of flight, ferry, and car from Whitsunday Island to Fraser Island in 10.5 hours. Alternatively, you can do a combination of train, ferry, and car; or do a combination of bus, ferry, and car. Finish your sightseeing early on the 15th (Thu) to allow enough time to travel back home.